Jaipur, Feb 9: Together with by many supporters, Gujjar leader Kirori Singh Bainsla started an agitation on railway tracks in Rajasthan’s Sawai Madhopur District for 5% reservation in state jobs and educational institutions. 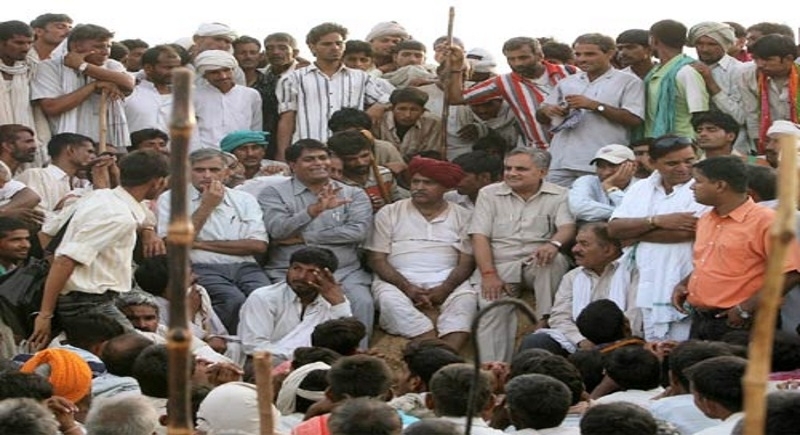 In December, Gujjar leader Kirori Singh Bainsla had given 20-day “Ultimatum” to Rajasthan government to make a stance clear on quota to 5 communities along with Gujjar. The deadline lapsed on Friday, but no announcement from government n this regard, Bainsla started dharna along with his supporters on Delhi-Mumbai train route after Maha Panchayat held by Bainsla at Malaran Dungar. Further, He added, “We want five percent for our community, the way the Centre has given 10 percent to the Economically Backward Classes. The government did not respond to our demand, neither did anyone come to talk to us, so we were forced to take this step." This agitation started for 5 % separate reservation to Gujjars, Gadia Luhar, Banjara, Raika-Rebri and Gadaria. At present these communities are getting one percent separate reservation as part of the legal limit of 50 percent. Several Gujarat linked trains canceled, diverted, delayed, Short originated or terminated. The security has been tightened across several districts of the state including Sawai Madhopur, Ajmer, Kaurali, Bharatpur, Dholpur and Jaipur due to Gurjar agitation. State government constituted a three-member cabinet committee to initiate a dialogue with the agitators. Meanwhile, taking the perception of the Gujjar agitation, the State Human Rights Commission directed the government to inform it of steps taken to protest those affected by the stir by Monday. Meanwhile, Chief Minister Ashok Gehlot said that state government has taken all possible steps in this direction, and now central government is to decide about the matter.